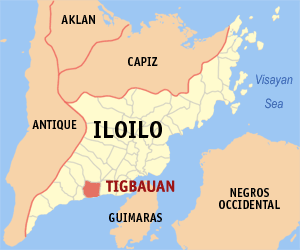 Tigbauan, my beloved hometown, is a municipality in the province of Iloilo, Philippines. It is located 23 kilometers southwest of Iloilo City. It acquired its name, like the majority of town centers, after a topographical distinction unique to the region – in this case after the Tigbao, a local name for a type of grass that used to swarm the countryside. Tigbauan, a coastal town, was one of the landing sites for American Forces led by General Douglas MacArthur in March 1945 for liberation of the Philippines from the Japanese in World War II. 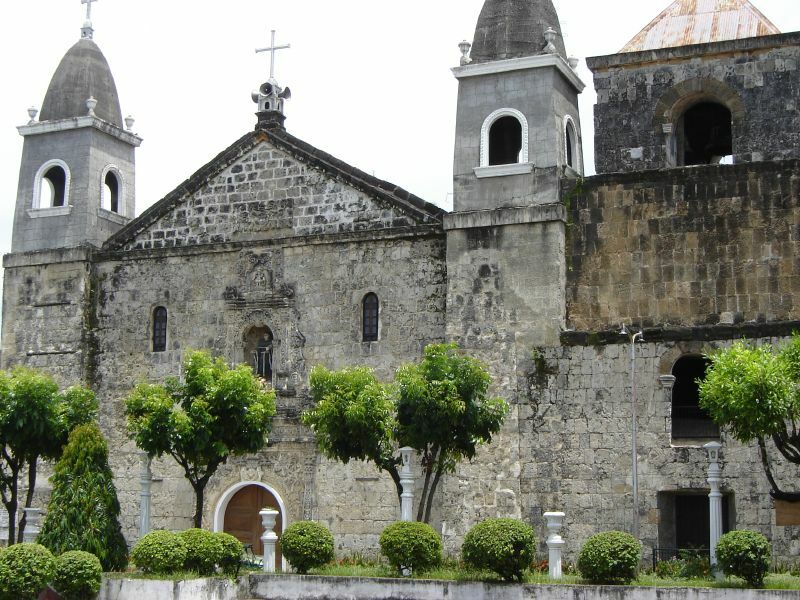 The ADMU website has a comprehensive article about San Juan de Sahagun church in Tigbauan. An ecomienda given to Esteban Rodriguez de Figueroa, Tigbauan became a visita of Oton on 3 March 1575. 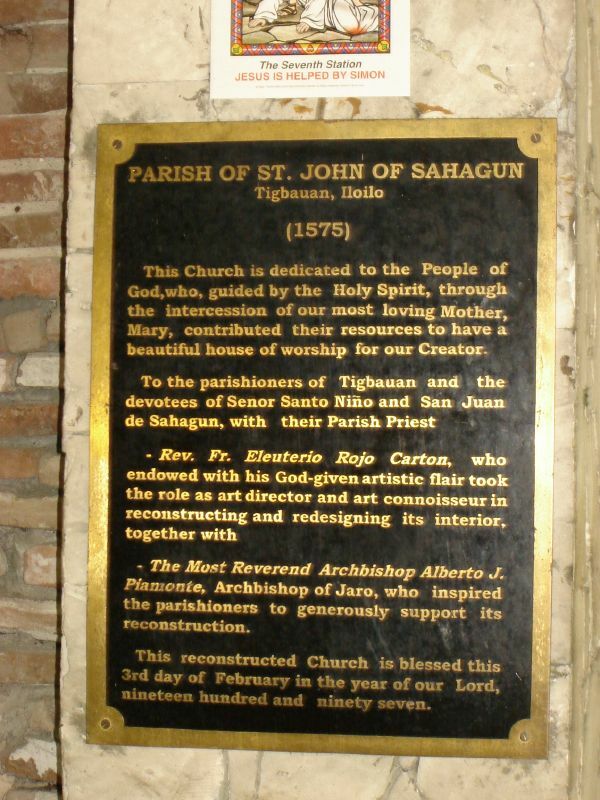 Although it had become an independent parish in 1578, no permanent priest was assigned to Tigbauan until 1580, when Fr. Luis de Montoya was assigned as prior. Originally under the advocacy of Our Lady of Grace it was later renamed Juan de Sahagun, after an Augustinian saint. In 1593, the parish was handed over to the secular clergy because the friar, Fr. Garcia de Quiroga, was appointed secretary of the province and had to leave the Visayas. The seculars held the parish until 1617 when they were assigned to Antique (Hamtic) in exchange for Tigbauan. Fr. Fernando Camporredondo may have built the Tigbauan church described in a report of 1848 as made of yellow limestone and which survived the earthquake of 13 July 1787 despite its considerable height. Fr. Fernando Martin is credited with building the present church, though Augustinian historian Pedro Galende, opines that he may have reconstructed a previous church, since the description of his work corresponds to the one previously mentioned. Only the church facade, bell tower and a few pillars of the convento remain. The same earthquake that brought Oton to the ground damaged the interior in 1948, apparently. 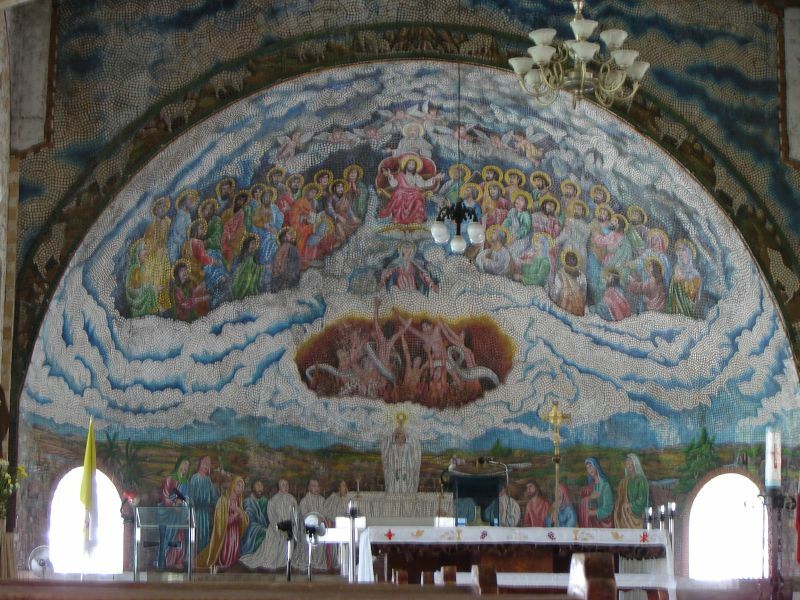 The interior is greatly renovated and has been decorated with mosaics in 1994. Heritage Features: The facade design is simple: a rectangle surmounted by a triangular pediment, the whole hemmed by thick pillars on either side. To the facade’s right is the three-story bell tower composed of cubes decreasing in size and capped by a pyramidal roof. A lintel and post doorway and an arched window mark the first story while the second story has no apertures. The third story had arched windows. What gives the whole facade distinction is the low relief decorating the central portal. Here a retablo-like design fills the central section. Pilasters, similar to the Mexican estipite flank the entrance, between are low relieves of flowers and cords, all finding focus in the cherub head that decorates the capstone of the entrance. Running horizontally from pilaster to pilaster is a floral frieze at whose center is the seal of the Augustinian order. This band marks the division between the first and second stories. Above is a niche flanked by pilasters embellished with flowers and volutes. The church patron San Juan is depicted. Above the niche is a low relief of the Santo Nino inside a niche. The triangular pediment of the whole structure carries a low relief of flowers arranged inside a rectangular plaque. Posted on July 17, 2006 by deuts. 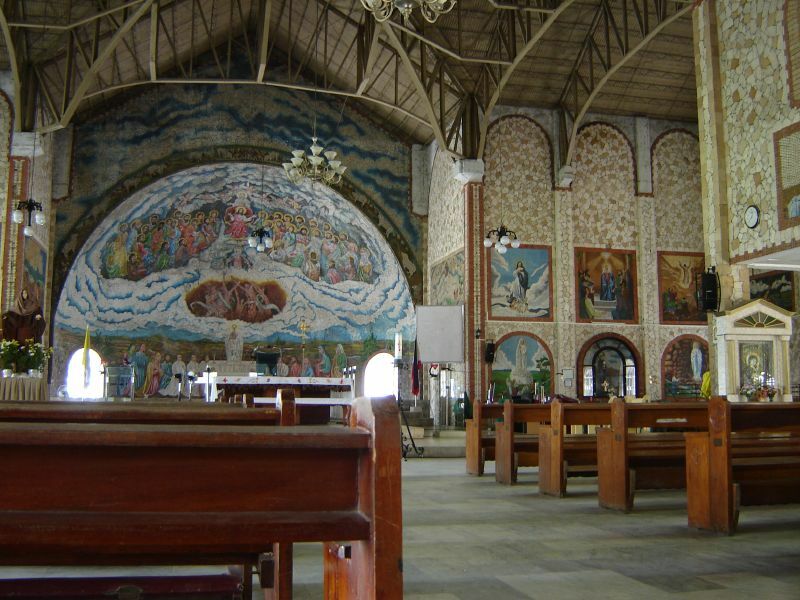 This entry was posted in Travel and Places and tagged Church, Iloilo, St. John of Sahagun, Tigbauan. Bookmark the permalink. These are the things I miss about Tigbauan. The Tigbauan Church is very nice-looking (although the facade sets me off a bit). 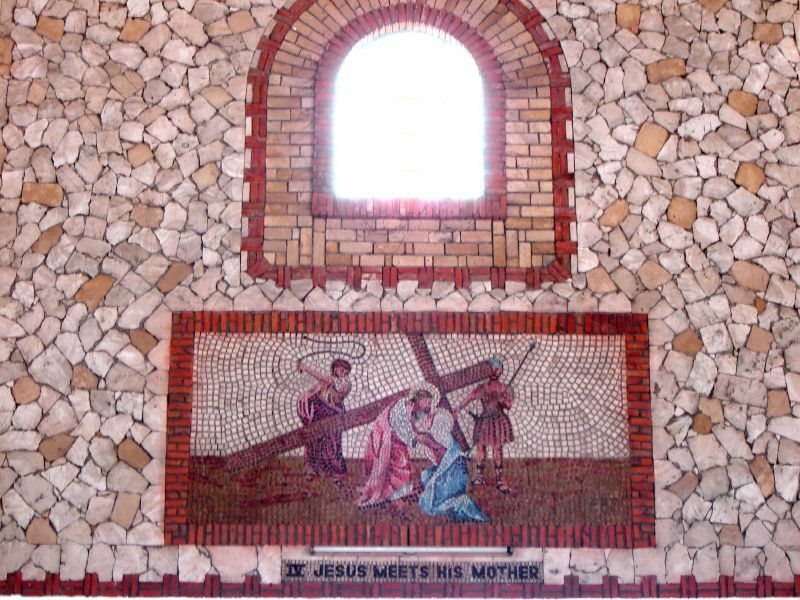 I was surprised the first time I saw the interiors of the church and found that it was totally made of mosaic tiles. I just can’t imaging the amount of skill, detail, and patience put into the structure. Hey, thanks for visiing my site. I like your pictures taken of Tigbauan as well. Thanks. Taga Tigbauan man ako. 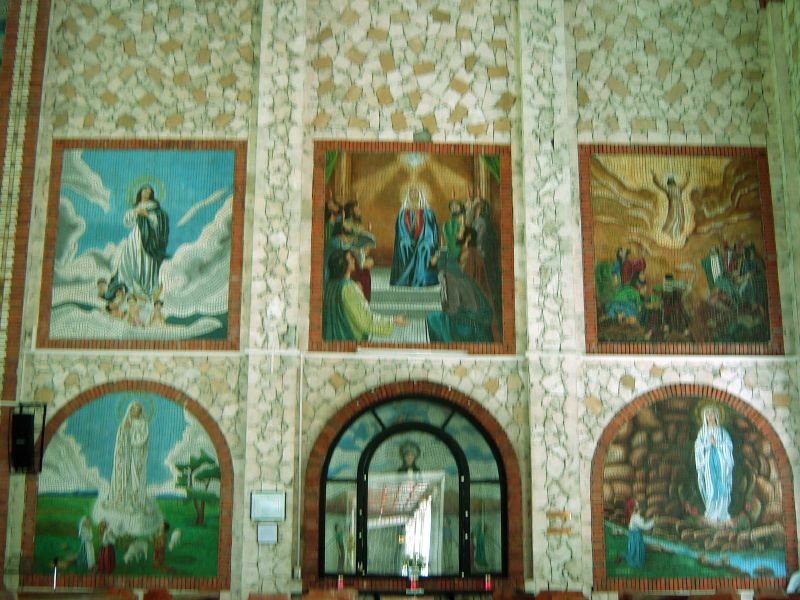 Although indi gd mn nami ang facade kang Tigbauan Church compared bi sa Miagao Church which is a UNESCO Heritage Church, we should still be proud for the very beautiful interior of our church.. Mosaic tiles ni ya ang aton!!! I do hope a restoration process will soon be done para ma-preserve ang beauty sang damu2 nga paintings sa interior nga daw gakapanas na subong..
Greetings to all fellow Tigbauños! It has been years ago, I never explore my birth town. Nevertheless, look at now, it has greatly transformed and developed. The place that I could never disregard throughout my verve. Because of the countless things has part of my life. In somehow, this town will be considering as finest town in southwest of Iloilo City, wherein there are newly build up beaches, the legendary church, the landing sites for American Forces led by General Douglas MacArthur in March 1945 for liberation of the Philippines from the Japanese in World War II, and the diverse striking barrios to visit that can boost our anticipation to serve our guests and fellows as well. 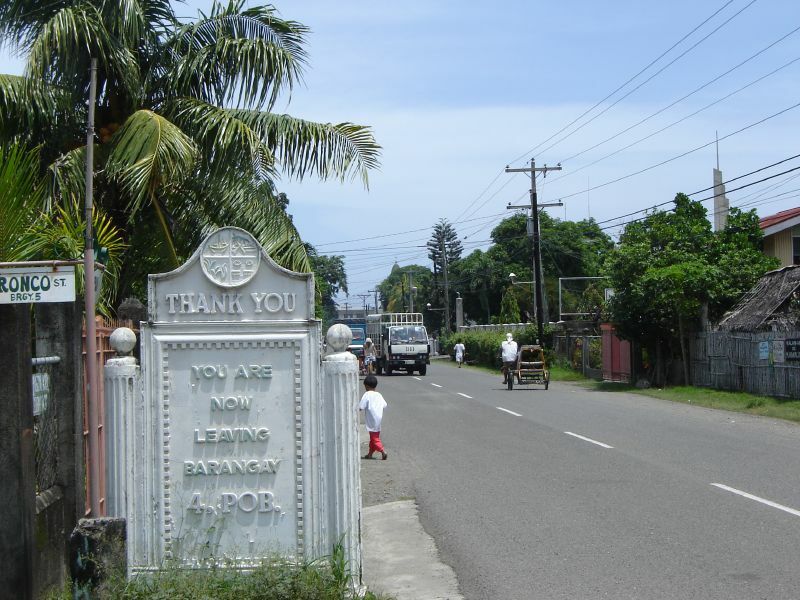 Discover Tigbauan of their courtesies & hospitability is being best known. Thanks Nilo for visiting my site. I hope we can make a website for all Tigbauenos! Baw kanami magbisita sang web kung makita mo ang handumanan sang ginhalinan mo. 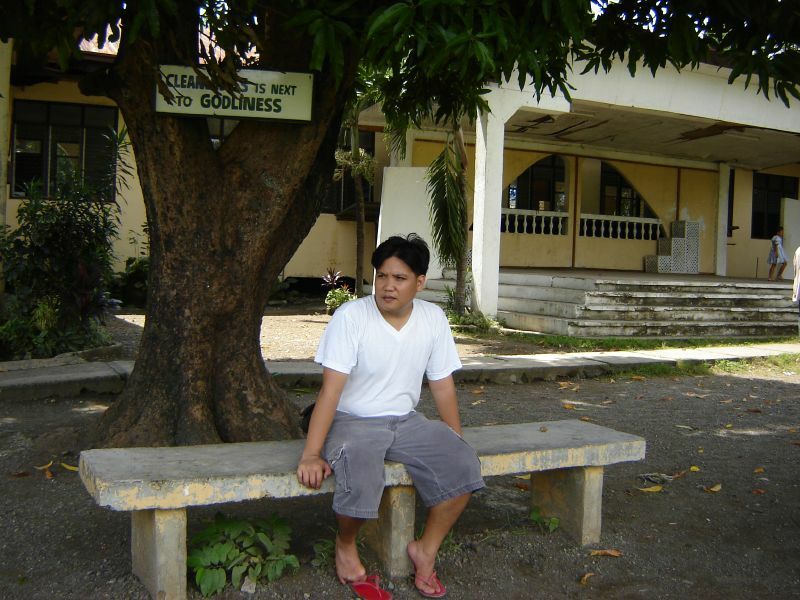 Last Dec. 2008 lang ko nag-uli pero daw nahidlaw ron ko liwan kang Tigbauan ba. Tuod nga rako nagbag-o sa Tigbauan, pero rako gihapon ang mga dapat pa gid bag-ohon. By the way, when I went home sang Christmas, may project ang parokya nga i-restore ang Kampanaryo sang simbahan. Since years the parish had been using the mechanical bell, now the new parish priest proposed to restore the original `kampanaryo. Hope to see a more progressive Tigbauan in the immediate years!!!!!! it is always a nice feeling to be home…comforting,relaxing and heartwarming with all loved ones at sight and within reach.Home gives us a unique blend of emotion and satisfaction other places cannot give.thanks for the photos above.they drive me to where i belong and i feel good…..2 months ago i was home and i am witness to the on going reconstruction of our public market. improvement of our town plaza and construction of our senior citizens building sa front kng munisipyo (am i right in this,forgive me if i am not). salamat kay na umpisahan n man guid sa kadugayon sang paghulat sang tanan.thanks for the effort of those behind all these.the idea of creating a website sang mga LGU is perfect.duro ang ga internet and i believe makabulig guid sa discussion kang mga issues and concerns ang mga responsable nga maga participate para sa karaydan kng aton nga banwa.hope we all join for a far better tigbauan. maa, we have a new website of our own.much better than that offered by the provincial government..its http://www.tigbauan-iloilo.com.tnx! may ara man kita website subong….www.tigbauan-iloilo.com. Try nyo man i-visit kay mahidlaw kamo sa banwa ta. There’s not even a subscription option (just like this https://deuts.net/subscribe) in the the site, where we can subscribe to updates and news from the town? And a forum maybe. A feedback page – and the first feedback I’d like to point out is, what’s with the ALL CAPS? sir, first of all, we are only starting out and all of us here have no background or degree in website building nor programming or what so ever. we never even imagined that we will be doing this,we could have appreciated your comment if it didnt sound so demanding. it would have been better and we would have been very thankful if u did it your self in the first place.we hope next time youll be a bit nicer.we are also doing our best so somehow bridge the distance between our town and our kasimanwas over seas. I’m not sure how I have been rude on you or about the issue. I’m sorry if I sounded rude. Please take it as a constructive criticism. After all, you may want inputs, I suppose. In as much as I would like to build a website dedicated to Tigbauan as well, I don’t really have the resources on what to put in there. Content–you know. I would be very glad to help if you need it. Send me a private message and we can discuss. By the way, I like what you have there so far. There’s a lot of improvements that can be done, I know. Just tell me where can I help. Tigbauanon man ako. Natawo ako dira. 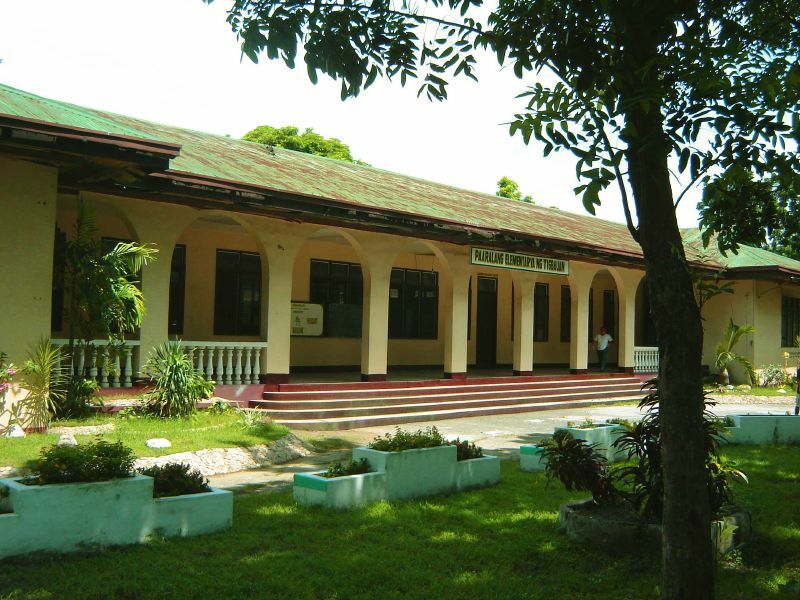 Natapos ko 2nd yr. sa Tigbauan HS. In 1962 we settled here in Zamboanga City. My mother belongs to the Ledesma clan. I worked all the way to college and finished BSE here in ZC w/ 3 Yrs. teaching experience. We do take vacation every summertime and at times we spend Yr.-end holidays there. I am still employed at Dept. of Budget & Mngt. RO-IX, ZC. Every day I Do remember my hometown a very nice and lovely town. My warmest regards to everyone out there. 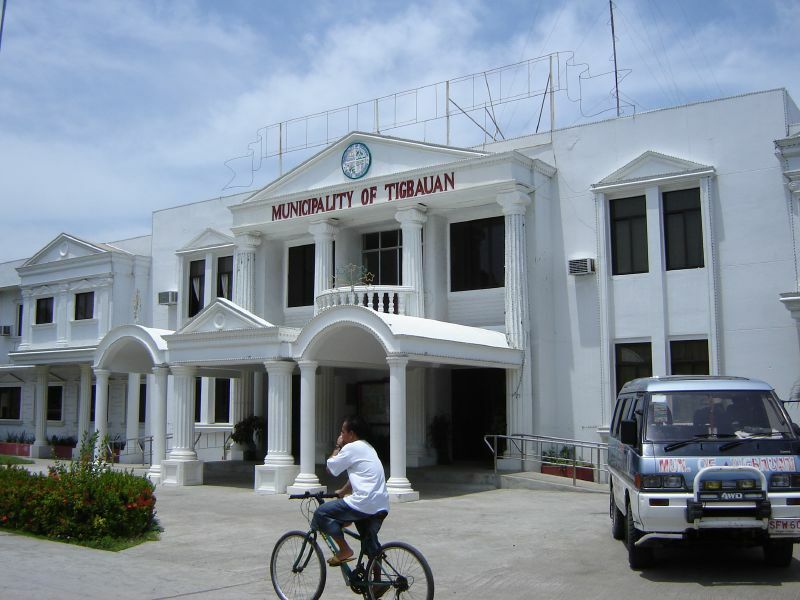 I’m so happy that we have this site in the internet about our beloved hometown, Tigbauan,Iloilo where I spent my first 22 years.I graduated from Tigbauan Elementary(1981)and Tigbauan National High School(1985)and left my hometown year 1990 after I obtained my Nursing Degree.Wherever I go,I would never forget the place that nurtured and nourished me to keep all my good values,faith and my sense of Pride being a pure blooded Tigbaueno.My parents are both born and raised Tigbaueno.I attended the California Tigbauan Association in Long Beach California and was amazed how successful and blessed our Fellow Kasimanwa,all coming from a very humble beginnings and are now successful enterpreneurs and professionals.So very proud to be a Tigbauanon.Pag pauli ko year 1999 and 2002 tama ron gid ka rako ang pag bag-o sang Tigbauan.Daw nabulong man ang akon kahidlaw nga nakita ko ang akon pamilya kag mga kaparyentehan sa banwa.Bisan diin ako magkadto …it gives me a good picture of my roots and it helps me keep my feet on the ground.There’s really no place like home.Tigbaun indeed is my home sweet home!To the Administrator of this site Congratulations and May the Lord God Bless You.Excell Tigbauan!!! !